Lads had a great time in Spain, plenty of paddling, and managed to squeeze in a tour around the Caves under Gibraltar! 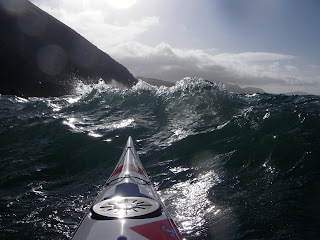 Large swell and lots of sun made for excellent surfing and day trips along the coast. 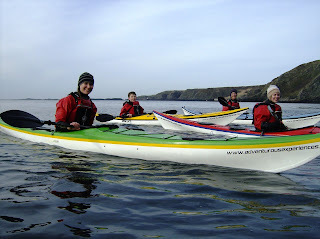 Joe, Butler and Neil completed their Coach 3 Training, provided by Sea Kayaking UK, many thanks to all their helpful and friendly staff, and further thanks to Phil for running us round in the bus with a constant smile and no complaints! Weather and wind exactly as predicted! Whilst setting up at Ny Arbyll beach about 9:30, a Minke Whale surfaced in the bay. Just the one sighting as it seemed to be moving the direction of Peel. 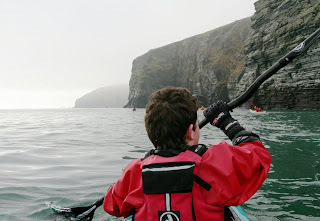 The intermediate group followed the coast to Flashwick Bay, where a spot of lunch and the well used flasks produced some decent hot chocolate. Then explored the caves and inlets on the way back. 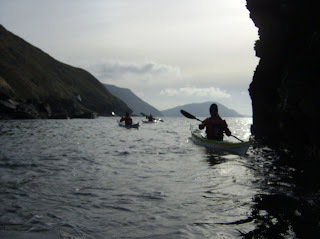 Plenty of noise coming from the seal caves, and a few friendly heads bobbing about as we passed. And a clourful rainbow display behind the waterfall at Gob Yn Ushtey (below Eary Cushlin). 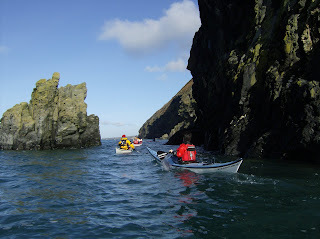 The beginners group also headed South from Ny Arbyll, fantastic views down to the Calf of Man, and excellent clarity of the water enticed us to peer into the depths as we paddled. 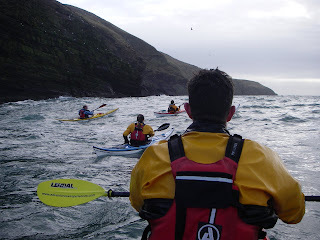 The wind started to pick up, so we turned and headed back, and out round Point (quite choppy so added a bit of excitement) and towards Peel. A pair of Eider ducks took off from the shore, and occasional Shags dived for their dinner around us. Then it was back to the trailer, and pack up. 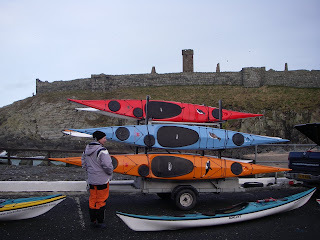 A day to celebrate - the new sea kayk fleet takes to the water! 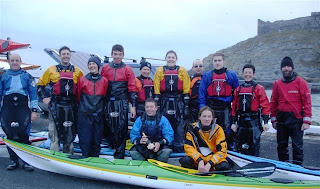 Each 'Sea Kayaking UK' (formerly NDK) is personalised with a hand painted picture of the different marine life you'll see whan having an 'Adventurous Experience' with us. 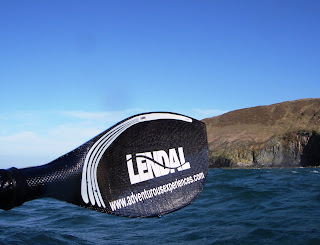 The name in Manx is also on each kayak, such as the 'Stronnag' - Guillemot and the 'Gobbag Vooar' - Basking Shark! I also recieved my Lendal Wings to practice with, in Preparation for the Vancouver Island Record Attempt in May this year. Delightful blades, plenty of extra power without loss of much support. Perfect weather to test them out in! 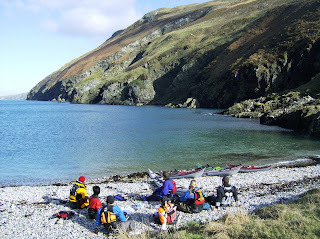 After the advanced Staff Training and a quick lunch, we unloaded the new kayaks from the trailer, and the Intermediates headed for Glenmaye, and the begoinners group staying within the confines of Peel bay. Neil, Gareth, Jenny, Joe, Janet, Lauren, Andy, John, Juliette, Terry, and front row myself and John. Thanks guys for a great day, see you next week! Following the beautiful Saturday sunshine, we met at Port Erin and surveyed the thick fog, hmmmm decisions, decisions! 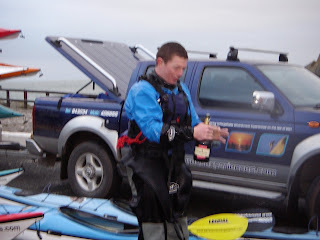 Conditions looked set to clear quicker from Port St mary, and as we paddled out, so did the sun, very pleasant. Kim's Bday treat was a ride in the 'Mighty Triton Experience'. He loved it. So much for it being a 'drybag'! It did a few more pics before finally giving in. So we may be reliant upon borrowed waterproof models until it can be speedily replaced. Much less of a baby seal population at the Calf on this trip, seems that one theory of the recent Orca sightings is that the young Killer Whales are brought here, as of other locations with large seal colonies, to learn how to catch the young seal pups! Hot chocolate seems to be the 'in thing'! Easy day Saturday, enjoying the beautiful weather and motivated by the sightings of 6 Orcas off the Calf this week, decided to take a gentle stroll along the South Coast in the hope of sighting some interesting marine life. On the way spotted Doug and Beef making best use of the weather... Looked a bit difficult so I hastily made my excuses and trotted after the others. A few new climbs on this wall ranging from E4 - E7, with no obvious escape route. Lunch overlooking the Chasms, watching sea kayakers paddling past far below. Then following the coastal path round Black Head and Spanish Head till the Calf Sound came into view. A flock of Choughs were circling just in front. This area of the Island is one of the few main breeding sites in the UK for these birds, and is one of the main species identified as protected by the Manx National Heritage, ensuring a climbing ban on these cliffs between Mid March - Mid July.